The Home Builders Association of Lane County is proud to produce this popular civic event and we are delighted that you have taken this opportunity to join us! Homeownership truly is an important part of the American way of life and today’s market offers unprecedented opportunities for those wishing to take advantage of building or purchasing a new home. Housing is back on a healthy track and now is the time to buy. One of the many advantages to new home ownership that we are proud to showcase is the innovation and new construction techniques that make today’s new homes more efficient than ever. And, while they can be more affordable to operate, these new homes also are significantly more resource-efficient and environmentally friendly. In addition, these new homes are designed to accommodate today’s busy lifestyles with open floor-plans, flexible spaces, improved safety features, and low-maintenance materials. There really is no place like home. Although there are many positive financial aspects to homeownership, a home cannot be valued in monetary terms alone. Not only can homeownership be a steppingstone to greater financial well-being, it provides a permanent place to call home and great personal satisfaction. Homeownership is truly a cornerstone of the American way of life. 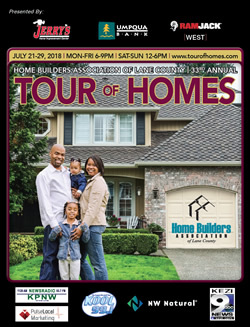 The 2018 Tour of Homes provides you the opportunity to visit with nine professional builders proudly showcasing their homes. As you tour the homes please take photos, ask questions, make notes, and talk to the builders. All we ask in return is to respect the new homes and wear the provided booties over your shoes (no bare feet allowed). And, be sure to visit some of the interesting displays in garages that will introduce new trends and innovative products enhancing the homeowner’s quality of life and preserving the earth’s resources. You’ll discover several ideas among the many choices as you explore homes displaying the latest trends and technologies. As you enjoy the Tour of Homes, please realize that it is the result of a large volunteer team investing enormous amounts of time and energy to ensure the tour’s success. We’d like to thank each and every one, as well as the Builders and Sponsors, for making it all possible. Mike Dotson, Neil Kelly Co.
Alan Ludvickson, Overhead Door Co.